Baked squash with bacon has the perfect blend of tender yet crunchy summer squash and smoky bacon. I first encountered this super simple dish at a pot luck cookout. There was a line waiting for seconds of this squash while my beloved Bacon Ranch Potato Salad got passed by. (and that potato salad NEVER gets passed by!) so I knew I had to find out the secret. Slightly crisp tender, buttery, slightly smoky from the bacon... awww so good! A friend of mine had brought it and happily shared the recipe. It was simple and basic, yet shouldn't summer cooking be just that? 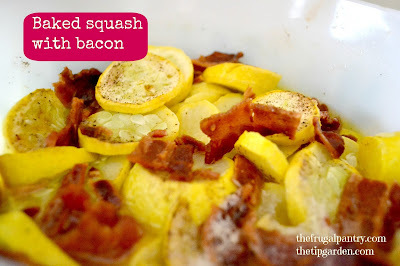 Squash recipes just taste better when you keep it simple and fresh! 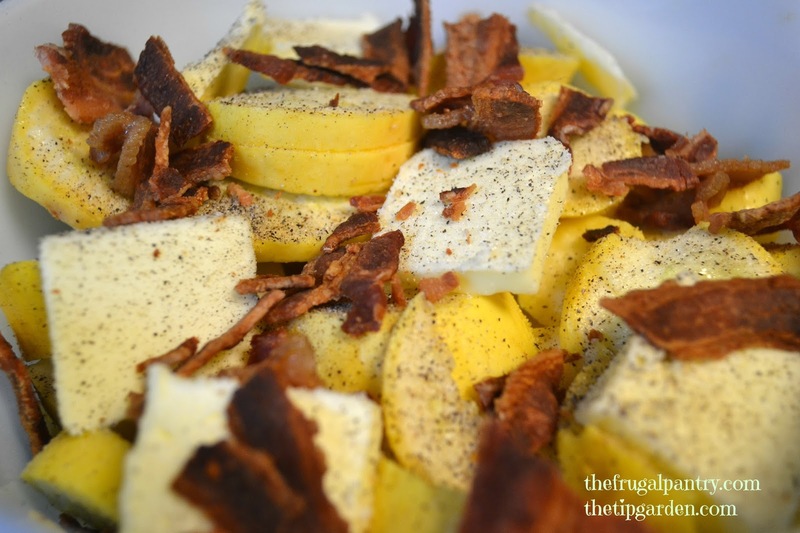 You can use zucchini or yellow squash or both! Jan's Tip: Don't want to heat up the kitchen by baking the dish? Make it a quick saute in a frying pan, or use your microwave. In oven proof casserole dish add sliced squash. Cut butter into small slices and dot around the top of the squash. Sprinkle squash with salt and pepper. Bake 350° 20-25 min. or until squash is tender with a fork but still crisp.